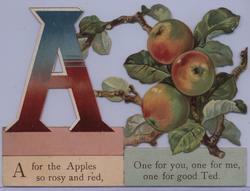 A FOR THE APPLES SO ROSY AND RED, ONE FOR YOU, ONE FOR ME, AND FOR GOOD TED. 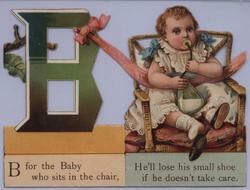 B FOR THE BABY WHO SITS IN THE CHAIR, HE'LL LOSE HIS SMALL SHOE IF HE DOESN'T TAKE CARE. 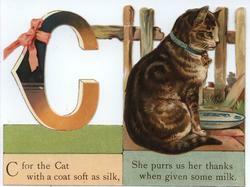 C FOR THE CAT WITH A COAT SOFT AS SILK, SHE PURRS US HER THANKS WHEN GIVEN SOME MILK. 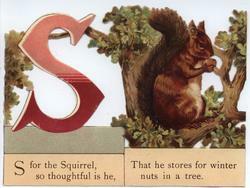 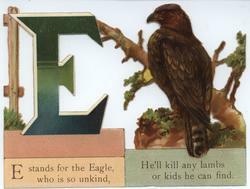 E STANDS FOR THE EAGLE, WHO IS SO UNKIND, HE'LL KILL ANY LAMBS OR KIDS HE CAN FIND. 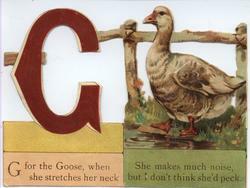 G FOR THE GOOSE, WHEN SHE STRETCHES HER NECK SHE MAKES MUCH NOISE, BUT I DON'T THINK SHE'D PECK. 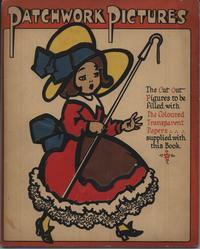 no number or markings. 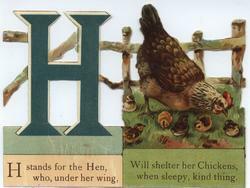 H STANDS FOR THE HEN, WHO, UNDER HER WING, WILL SHELTER HER CHICKENS, WHEN SLEEPY, KIND THING. 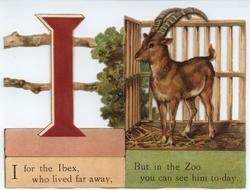 I FOR THE IBEX, WHO LIVED FAR AWAY, BUT IN THE ZOO YOU CAN SEE HIM TO-DAY. 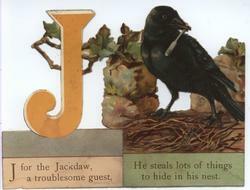 J FOR THE JACKDAW, A TROUBLESOME GUEST, HE STEALS LOTS OF THINGS TO HIDE IN HIS NEST. 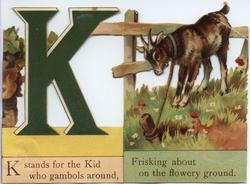 K STANDS FOR THE KID WHO GAMBOLS AROUND, FRISKING ABOUT ON THE FLOWERY GROUND. 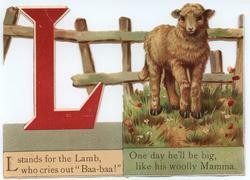 L STANDS FOR THE LAMB, WHO CRIES OUT "BAA-BAA!" 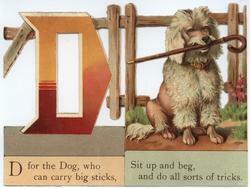 ONE DAY HE'LL BE BIG, LIKE HIS WOOLLY MAMMA. 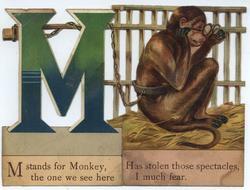 M STANDS FOR MONKEY, THE ONE WE SEE HERE HAS STOLEN THOSE SPECTACLES, I MUCH FEAR. 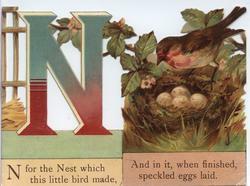 N FOR THE NEST WHICH THIS LITTLE BIRD MADE, AND IN IT, WHEN FINISHED, SPECKLED EGGS LAID. 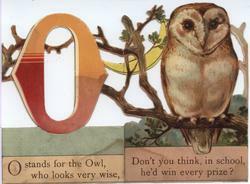 O STANDS FOR THE OWL, WHO LOOKS VERY WISE, DON'T YOU THINK, IN SCHOOL, HE'D WIN EVERY PRIZE? 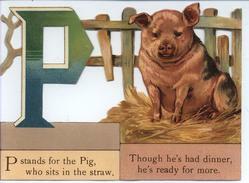 P STANDS FOR THE PIG, WHO SITS IN THE STRAW, THOUGH HE'S HAD DINNER, HE'S READY FOR MORE. 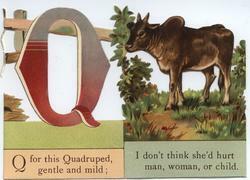 Q FOR THIS QUADRUPED, GENTLE AND MILD; I DON'T THINK SHE'D HURT MAN, WOMAN, OR CHILD. 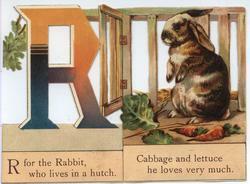 R FOR THE RABBIT, WHO LIVES IN A HUTCH. 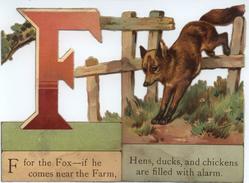 CABBAGE AND LETTUCE HE LOVES VERY MUCH. 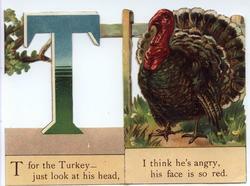 T FOR THE TURKEY-JUST LOOK AT HIS HEAD, I THINK HE'S ANGRY, HIS FACE IS RED. 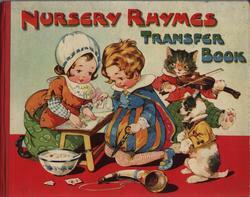 no number or markings. 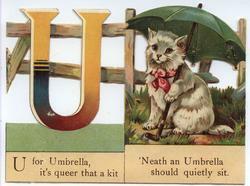 U FOR UMBRELLA, IT'S QUEER THAT A KIT'NEATH AN UMBRELLA SHOULD QUIETLY SIT. 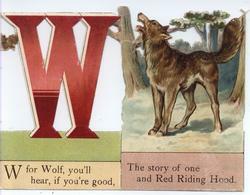 W FOR WOLF, YOU'LL HEAR, IF YOU'RE GOOD, THE STORY OF ONE AND RED RIDING HOOD. 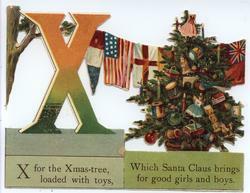 X FOR THE XMAS-TREE, LOADED WITH TOYS, WHICH SANTA CLAUS BRINGS FOR GOOD GIRLS AND BOYS. 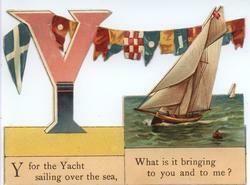 Y FOR THE YACHT SAILING OVER THE SEA, WHAT IS IT BRINGING TO YOU AND TO ME? 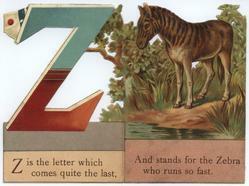 Z IS THE LETTER WHICH COMES QUITE THE LAST, AND STANDS FOR THE ZEBRA WHO RUNS SO FAST. 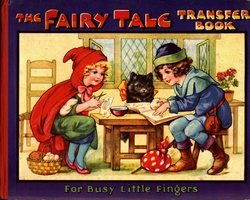 EACH BOOK CONSISTS OF A BEAUTIFUL COLOURED COVER AND HAS SEVEN PAGES OF CHARMING COLOURED PICTURES READY TO BE CUT OUT AND MADE UP INTO SEVEN LOVELY PEEP-SHOWS, HAVING A FRONT SCENE, CENTRE SCENE AND BACKGROUND SCENE. 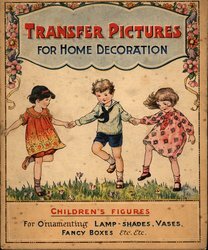 ALTHOUGH THEY ARE VERY CLEVERLY CONTRIVED, THE MAKING UP OF THEM IS A QUITE SIMPLE MATTER AND FULL DIRECTIONS ARE GIVEN IN FRONT OF EACH BOOK. 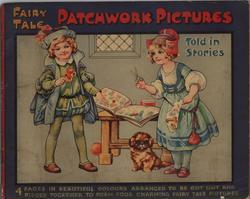 FROM THIS BOOK CAN BE MADE WONDERFUL PEEP-SHOWS OF "PUSS IN BOOTS," "CINDERELLA AND THE GLASS SLIPPER, " "SNOW-WHITE AND ROSE-RED, " "LITTLE RED RIDING HOOD," "THE THREE BEARS," "BEAUTY AND THE BEAST," THE SLEEPING BEAUTY", ALL SHOWING WELL-KNOWN SCENES IN THE VARIOUS STORIES. 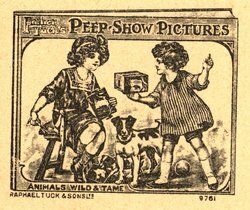 FROM THIS BOOK CAN BE MADE PEEP-SHOW SCENES OF ANIMAL LIFE IN FARMLAND, AND ON THE COUNTRYSIDE, ALSO IN FOREST AND JUNGLE, ALL SORTS OF ANIMALS AND BIRDS BEING SHOWN, ADMIRABLY LIFELIKE AND ALL HIGHLY INTERESTING AND INSTRUCTIVE. 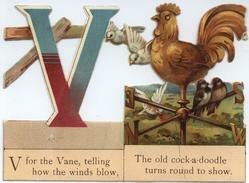 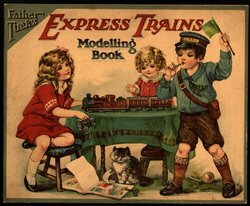 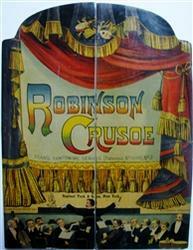 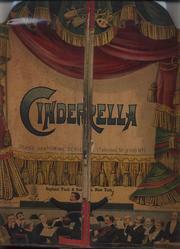 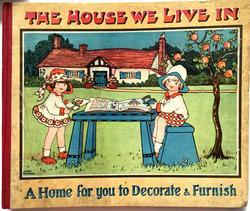 A BEAUTIFUL BOOK FULL OF DELIGHTFUL TOYS, TO BE CONSTRUCTED BY AN EXTREMELY CLEVER, PATENTED, BUT VERY SIMPLE DEVICE. 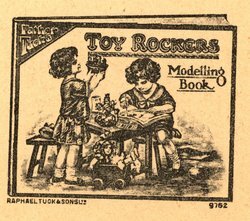 THERE ARE SEVEN PAGES OF LOVELY DESIGNS OF ANIMALS, DILLS AND OTHER TOYS, WHICH WHEN CUT OUT AND MADE UP GIVE FOURTEEN CHARMING MODELS OF ROCKING HORSES, ROCKING BOATS, ROCKING CHAIRS, ETC., WHICH ROCK UP AND DOWN IN A FASCINATING WAY. 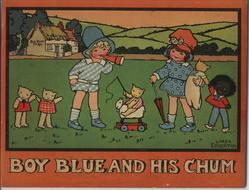 HERE ARE TO BE FOUND "THE THREE LITTLE KITTENS," "A FINE LADY UPON A WHITE HORSE," AND OTHER FAVOURITE NURSERY FRIENDS. 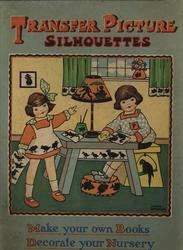 THERE ARE ALSO LITTLE DOLLIES TO BE CUT OUT SEPARATELY AND PUT UPON THE ROCKERS. 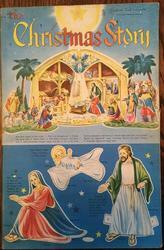 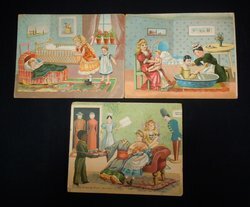 CUT THESE PICTURES OUT-THEN BEND AT ALL THE DOTTED LINES TO MAKE THEM STAND UP STRAIGHT. 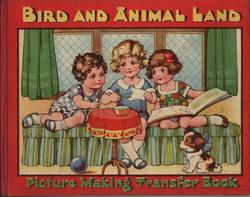 WHEN YOU HAVE CUT OUT ALL THE PICTURES IN THIS BOOK, YOU CAN PLACE THEM ALL TOGETHER AND MAKE ONE VERY LARGE PICTURE. 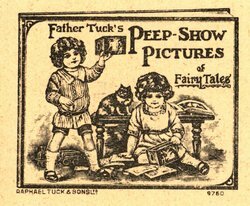 twelve half pages with one page stuck on the the inside back cover, shaped cover in the form of a theater with the opening down the centre. 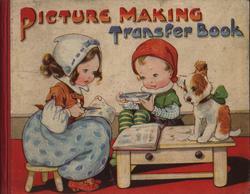 Four different full-page pictures can be made from each book, cut to shape.